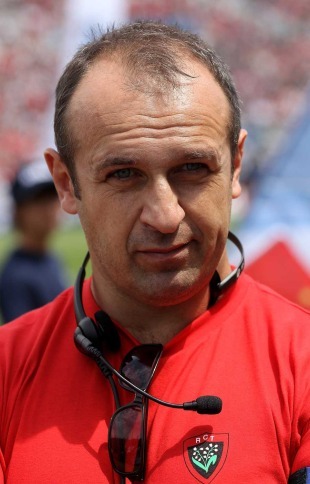 Toulon's sporting director Philippe Saint-Andre is set to land the French head coach post according to reports. The former France winger is due to replace Marc Lievremont - who took over from Bernard Laporte following the 2007 tournament - after the showpiece tournament. Lievremont has had a mixed reign at the helm having taken the 2010 Grand Slam but also suffering a defeat to Italy in the 2011 Six Nations. And it appears the former Sale director of rugby Saint-Andre is the man charged with bringing success back to France. However, whether the France squad will be distracted by the timing of the announcement remains to be seen. Saint-Andre will reportedly be unveiled later this week and his current boss - Toulon's Mourad Boudjellal - has called upon the French Rugby Federation (FRF) to co-ordinate the move in the best possible fashion for both parties. "It is vital that the Federation co-ordinates its contractual calendar with the coaches contracts which come to an end on June 30," said Boudjellal. "It is in any case difficult to find a coach of this level at this time of year." While Saint-Andre has refused to comment on the reports, Boudjellal will be upset at the timing of the announcement. The French domestic season is due to start on Friday and Boudjellal admits he has not yet heard anything official regarding the appointment. He said: "I learnt all this from reading the press, but it is good news for Philippe and a source of pride for the club. "On the human side, it is slightly disappointing because even if sometimes he was confrontational, he was very professional and very agreeable company." Reports suggest Saint-Andre will appoint Yannick Bru, presently Toulouse forwards coach, and another former France winger Patrice Lagisquet, who was recently hired by Biarritz, as his backroom staff. Lievremont's coaches Emile Ntamack and Didier Retiere are to be assigned other roles within the French Technical Centre at Marcoussis. While Boudjellal is rumoured to be looking into the possibility of recruiting former All Blacks centre Tana Umaga as the new head coach, the FRF's moves have brought widespread criticism from the other parties involved. Toulouse president Jean-Rene Bouscatel has slammed the FRF for its 'inadmissible' behaviour in the approach for Bru while the National Rugby League (LNR) chief Pierre-Yves Revol echoed Boudjellal's wishes for the approach to be done directly with the club.